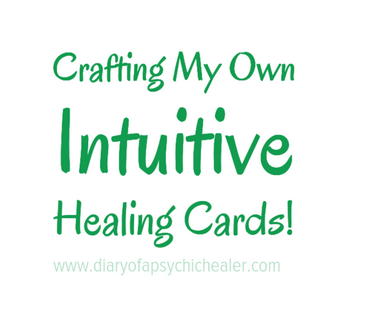 Diary of a Psychic Healer: Intuitive Healing Cards? Yes please! Intuitive Healing Cards? Yes please! I use oracle cards all the time for readings, usually the Angel Tarot deck. The messages I receive won't always relate to the description on the card; they are triggered by a visual cue that takes me somewhere else. By now I've probably given hundreds of readings on Facebook over the past few years. Yesterday I had an idea, what if I took the "healing element" in those readings and translated them into my very own intuitive healing deck? I might just start with a pack of blank index cards, write the message on one side and draw stick figures on the other. Pictograms are the best I can do, but the image will be clear in my mind. I also pulled a card for myself to get a bit more insight on this idea. The image that came up, from Stewart Pearce's Angels of Atlantis deck, tells me that I'll be able to access my soul's wisdom by creating these. Inspiration comes when we're being creative and this may be the step that I have to take now. 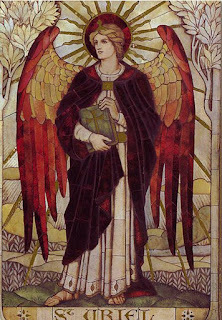 Image Source - Angels of Atlantis, by Stewart Pearce. You may also enjoy his books: Alchemy of Voice, Angels and the Keys to Paradise & The Heart's Note.